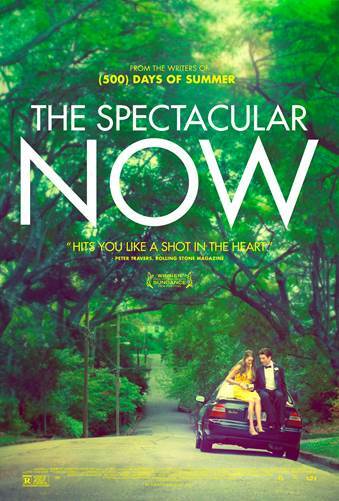 Sutter Keely, the high school senior at the center of THE SPECTACULAR NOW, is a believer in “living in the now” — not because he's a Buddhist or an adherent of Eckhart Tolle, but because it's his nature to resist change. An easygoing kid, he's content with his lackluster grades and his job at a men's clothing store. Unlike his friends, he has no plans to go to college. Miles' secure little world is shaken when his pretty blond girlfriend, Cassidy (Brie Larsson) dumps him, sending him on a painful emotional journey. The narrative is framed by the writing of a college admissions essay, in which 17-year-old Sutter (Miles Teller, who resembles a young John Cusack), recounts what happened after Cassidy broke up with him. “We were the life of every party,” he says. Sutter lives with, and exasperates, his hard-working single mom (the excellent Jennifer Jason Leigh). He's a budding alcoholic who is never without his silver hip flask, pouring booze from it into his Big Gulp cups at work. Sutter has an easygoing, fun personality that lets him get away with being irresponsible. He also has a considerate side. He helps his friend hook up with a girl, and initiates a relationship with Aimee Finecky (Shailene Woodley), a “nice girl” whose front lawn he wakes up on after a night of hard partying. Aimee is the kind of girl who has a newspaper route, and Sutter helps her deliver the papers. “Strange choice for a rebound,” remarks Sutter's friend, presumably because Aimee, while pretty, isn't a knockout like Sutter's ex. Sutter claims he's dating Aimee to help her — he says he's giving her a “boyfriend experience.” This seems a little cruel, but in time, the unlikely pair develop real intimacy. She tutors him in geometry, a class he's failing; he urges her to stand up to her unreasonable mom. Unfortunately, Sutter also introduces Aimee to drinking, on prom night presenting her with her with her very own silver hip flask. In lucid moments, Sutter realizes he's not good for Aimee. He's as noncommital about her as he is about his future; while dating Aimee, he pines for, chats online with and occasionally hangs out with ex-girlfriend Cassidy, who's now dating someone else. Aimee, looking on dejectedly while Sutter dances with Cassidy at the prom, is the embodiment of adolescent angst. Though she was not the first choice for the role (Saoirse Ronan was), Woodley is perfect as the shy girl who can't believe one of the school's most popular boys is interested in her. She has a natural, guileless smile that looks as though she just had her braces removed. Teller, who was memorable alongside Nicole Kidman in the 2010 RABBIT HOLE, ably inhabits Sutter's contradictions. At Aimee's urging, Sutter tracks down his long-absent dad, and that predictably ill-fated meeting holds up an unflattering mirror to Sutter and his lackadaisical way of life. Kyle Chandler's interesting performance as Sutter's distracted dipso dad lifts a cliché-prone situation to a higher level. This movie, like Matthew Quick's SILVER LININGS PLAYBOOK, demonstrates that there's a lot of talent residing on the young-adult bookshelf. 3 1/4 out of 4 stars.